Hi everyone! 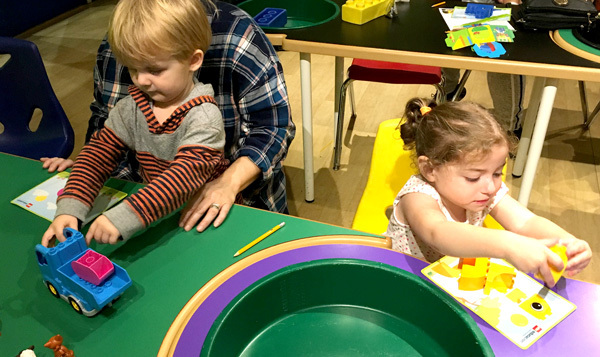 I hope you're all still geeking out over my Westchester Library infant & toddler programs master list, but if you are interested in something a little more physically active than storytime, head over to LEGOLAND Discovery Center in Westchester on Tuesdays for their Little Playtimes. We went recently to check it out and it was a blast. But first, don't forget to sign up for our 4-week Mommy & Me Meetup at Lil Chameleon in Tuckahoe! We've got lots of moms coming and space is limited. We're so excited to make some new friends and relax. And it's the season of thanksgiving, so I'd like to mention a cause that's dear to my heart. Fellow mom Angela is organizing a food drive of sorts. She's collecting restaurant gift cards to hand out to parents with ill children at Maria Fareri Children’s Hospital. They spend weeks or months in the hospital and the food gets real depressing really fast. I know because my son spent a week there during Christmas of last year. But Angela spent months there and didn’t get to bring her son home in the end. If you can spare a few bucks to help brighten the lives of families going through something similar, please donate through the link here. Her address is saved in the wishlist for easy shipping. Be thankful for every moment you get with your little guys. They tire us out sometimes but the alternative is too heartbreaking to mention. Little LEGO lovers can enjoy big fun at Little Playtimes on most Tuesdays between 10am and 2pm. Enjoy activities including DUPLO Story Time, Farmer's Workshop, and newly added Animal Bingo. It's $22 for one adult and one child ages 3 and up (additional children are $10) plus applicable tax. Children 2 and under are free, so if you come with a little one you'll just pay the adult price for you. And of course if you have an annual pass it's free. The big advantage of coming during Little Playtimes is that you can let your little one loose in all the exhibits without worrying about getting in the way of (or jostled by) the big kids. They can climb in the new Ninjago play structure, get on some of the rides, catch a 4D show, explore a miniature LEGO New York City, build in the several LEGO kiosks set up throughout the space, sing karaoke and pretend play in the LEGO Friends kitchen, slide and build in the DUPLO play area, and explore the whole kidzone at their pace. When we went it was pretty empty, so it was easy to relax and keep track of our little ones. The special toddler activities were a big hit as well. Tucked away in a building classroom, we stayed for the Farmer's Workshop and Bingo events. Our little ones set up a DUPLO farm at the farmer's workshop. Their team leader led them through the farm play set and quizzed them on colors and animal sounds. The Bingo game was the main attraction. We all got special LEGO Bingo boards that had a 6-piece DUPLO animal drawn on them. The blocks to build each animal were placed in a big bowl and the Bingo leader pulled out pieces and handed them out to the contestants whose game boards matched the color and piece. Whoever built their animal first won! But we all walked away with a fun prize. I never want to play Bingo the old way again! There's also a cafe selling healthy snacks, or you can bring in your own food and have a snack break. It was a great way to pass the morning. Our little LEGOheads left happy and tuckered out! (What more could you ask for?) For more information, visit LEGOLAND Discovery Center's website. That's it for this week! Don't forget to join us for our November meetup! Follow us on Facebook and Instagram. And as always, check our website for events and weekly library programs.